3 brand new Fenty Beauty products are coming to the Middle East on April 6 –and we're SO ready! 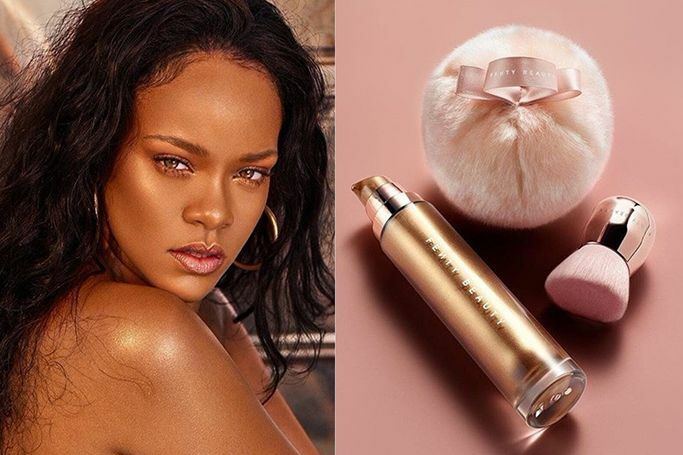 Rihanna’s Fenty Beauty brand is launching 3 new beauty products that will help you shimmer during the spring and summer months to come, with a Body Lava body luminizer, a Fairy Bom Glittering Pom Pom and a face and body Kabuki Brush, which are all available to shop in Dubai from April 6th –we can’t wait! Since its launch last year Fenty Beauty’s inclusive products for all skin tones and skin types have made it a makeup favourite across the beauty market, and especially in Dubai. Whether you need a post-holiday shimmer or a sunlit glitter all year-round, the smooth, gel-based body luminizer gives you the perfect glow. Which is ideal for when the Dubai summer is too hot, yet you still want to shine and achieve that summer radiance. The two products aim to accentuate all skin tones and develop a sun-soaked sheen effortlessly. This brush was made for diffusing both liquid and powder formulas with ease, as it also applies the Body Lava perfectly! The super soft bristles have a custom cut, unique brush head which was designed to cover your curves and contours. It creates a natural-looking finish and is seriously easy to use. To apply an instant body glitz, it has to be the Fenty Beauty Glittering Pom Pom! Old school glam is back with this luxurious body luminizer. It’s the perfect beauty accessory to apply your glitter with a smooth finish and an effortless glow. It’s designed to light up all skin tones with a coconut and vanilla scent that will remind you of beach days and summer holidays. Where To Buy Fenty Beauty Body Lava In Dubai? The new Fenty Beauty summer 2018 collection, which includes the high-anticipated Body Lava body luminizer, will be available to shop in the UAE exclusively at Sephora Middle East stores and through UAE online beauty store Sephora.ae, as well as at fentybeauty.com. All three new products will be available to buy in Dubai from April 6th –we’re already clicking refresh on Sephora as we speak!